In this post we take a look back at our favourite fireplace décor of Winter 2018. 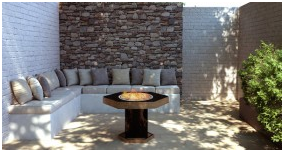 This outdoor pit fire, sporting simple, functional, and cosy surrounds, is a classic example of an outdoor fireplace and has all the makings of a fine place to keep warm. The natural stones and greenery give it a rustic charm, while the sofa and the wood fired heater add modern flair. This old chestnut. This is the classic wood fire mantlepiece you often see in suburban homes all across the country. The indoor plants are a lovely touch and the scene wouldn’t be complete without the bookshelf and the stereo. This may be an oldie, but it’s just so cosy and charming. 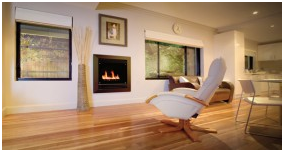 This scene is more of a minimalist approach and uses an inbuilt gas heater as the centrepiece of the room. 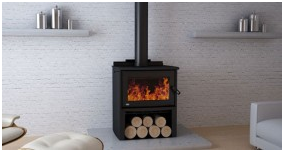 It’s a harmonious blend of modern furniture with traditional flooring and fireplace. This is a bit luxurious and opulent and wow, the view is amazing. This is a very fine example of a living room and a very expensive one no doubt. 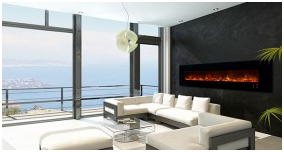 The landscape electric heater provides more than enough warmth and visual stimulation for this area. This is some good old fashioned cosy winter fireplace décor, using the winter palette to create a stylish yet homely feel – a nice place for the family to congregate. The exposed brick and wooden beam only add to its rustic charm. We love this décor. It’s so simple and so minimalist and allows the fire to be the star. It’s a case of industrial loft meets forest cabin meets modern apartment. It has that loft style rough brick wall, polished wooden floors, and the modern furniture, to have these three elements combine harmoniously. 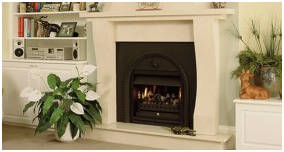 This list wouldn’t be complete without this classic natural stone mantle. The owner has really gone out of their way to make it as cosy and colour coordinated as possible. Notice all the throw pillows strategically placed and colour coordinated with the natural stone and the vases are a nice little touch that complete the whole scene. Although the winter of 2018 may have been cold and unbearable outside, it was a great excuse to crank the fire in living room, gather some friends and enjoy some good food, good company and good vino. 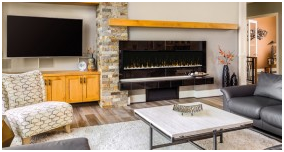 The fireplace décor of 2018 was a classically minimalist approach with rustic mantles and modern furniture and a great melding of design styles and eras. 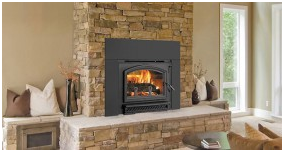 Don’t get caught out next winter and give us call or browse our website at Sydney Heaters and Pizza Ovens and we will happily hook you up with the ideal heating solution to match your heating and décor needs.